Medical studies report that deep rhythmic breathing benefits include reduced blood pressure, lower stress, with an increase in mental clarity, focus and concentration. Focusing on one's breath is one popular form of mindfull meditation. Interestingly, these benefits also corresponds with studies on the benefits of yoga and meditation. So many of the benefits of yoga and meditation can be obtained by using deep breathing techniques. Our Breath Pacing Lamp is designed to help you develop your own deep breathing routine and mindful meditation practice with a minimum investment in time. Slow, deep breathing can be very effective in influencing modern day problems such as stress, high blood pressure and loss of focus. While slow, deep rhythmic breathing techniques have a very long history in traditional oriental medicines, it is only been recently recognized by modern medicine. For example, people in medical studies practicing slow, deep breathing techniques have reduced stress, lowered high blood pressure. Increase in blood pressure following a stressful moment can be effectively dealt with by taking a minute or two to focus on slow breathing. Our Breath Pacer Lamp will help you achieve these deep breathing benefits by reminding you to do a few minutes of deep breathing each day, or whenever you need a moment to de-stress. The Breath Pacer Lamp sits unobtrusively on your desk or shelf, anywhere within eyesight of where you spend your day. Pace yourself to relax, reduce stress, increase focus and mental clarity. Deep rhythmic breathing works hand in hand with the practice of yoga and meditation. Yoga uses deep breathing techniques to achieve calmness in poses. Mindful meditation can be performed by focusing on rhymic breathing. In this mindful meditation practice, you focus on your breath, both on the inhaling and exhaling of your breath. During the day, most people cannot stop, sit in position to meditate. But you can steal a few minutes for rhythmic breathing. The Breath Pacer Lamp helps you achieve the benefits of deep breathing without sitting in meditation or practicing yoga poses. If you practice yoga, you know that yoga uses deep breathing techniques to achieve calmness in poses. Positioned the Breath Pacer lamp in eyesight ofyou practice area, it will help you maintain slow breathing during yoga practice. Meditation also has deep, slow breathing component. In meditation, one can focus on one's breath alone. You may ask yourself, I can stop a moment, take a few slow deep breaths and then move on. So why do I need a Breath Pacer Lamp? The answer is that our perception of time is relative. Ever notice when you're busy or rushed, waiting for even a few seconds, those seconds feel like minutes. I'm sure you have. If you stop to take a few deep breaths when you are under stress, how deep and slow will those breaths actually be? 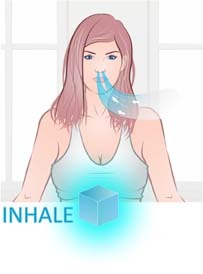 This is how the Breath Pacer Lamp helps. 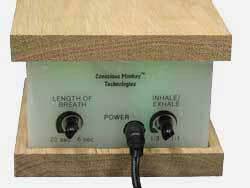 The Breath Pacer Lamp doesn't change its timing when you're rushed, stressed or under pressure. So you can be assured when using the lamp to pace your breaths even under stressful conditions, your breaths will be of the length and duration you previously set them to be. The lamp repeatedly cycles its color from blue to green. The changing color signals the inhalation, then exhalation of a single breath. You set the timing for the breath pace you are most comfortable. Once set, the lamp is positioned where you can see it during the day. For instance, you could place it on your desk or a bookshelf. The lamp reminds you to intentionally step back and take a few deep breaths throughout your day, bringing your attention inward. Whenever you are faced with a challenge you can take a moment, for a few relaxed deep breaths before moving forward to face that challenge. The Meditation Breath Pacer Lamp is unobtrusive. 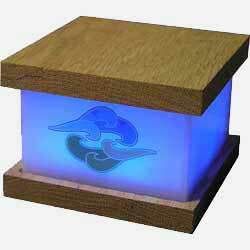 You can watch the lamp and synchronize your breath to take deep breaths without anyone knowing. In contrast to, say practicing yoga on the office floor without anyone noticing, not likely. 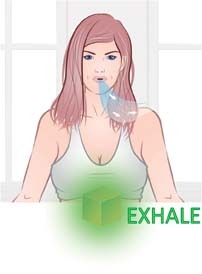 As with all deep breathing techniques, it is important to progress gradually and comfortably. If you feel any lightheadedness return to normal breathing. Images' Breath Pacer has two controls on the back. One control adjusts the length of one breath, an inhale and exhale. The time period can be varied from approximately 6 seconds to 20 seconds. See operating instructions link below for more information. This is not a medical device and can not be used as such. Try our Breath Pacer Lamp for 30 days. If you follow the instructions and invest as little time as six minutes a day for the next 30 days and you do not feel any benefits from using the breath Pacer Lamp, return the lamp to us for a full refund. Whether you purchase our Meditation Breath Pacer Lamp or not, remember the importance of slow deep breathing. The benefits of slow, deep breathing are being recognized and used in modern medicine, for managing a modern lifestyle. If you have problems staying focused, slow, deep breathing techniques are an effortless way of getting back your focus. The same is true for reducing stress. Want to reduce stress, spend a few minutes taking deep breaths. Reduction in high blood pressure has also been shown when engaging in a routine of slow breathing using one 10-15 minute slow breathing session per day for 4 to 8 weeks.